This quiz for hyponatremia and hypernatremia will test your ability to differentiate the causes, signs & symptoms, and nursing intervention between these two conditions. The questions on this quiz are some of the most common exam questions students are asked about hyponatremia and hypernatremia. 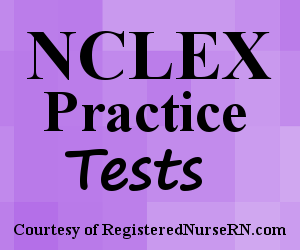 This quiz will test your knowledge on the differences between hypernatremia and hyponatremia (causes, signs & symptoms, nursing interventions). A. "I will buy fresh vegetables and fruits." B. "I will avoid eating canned foods." C. "I'm glad I can still eat sandwiches with bologna." D. "I will avoid cooking with butter." A. "Declomycin is an antidiuretic hormone antagonist that treats SIADH." B. "Declomycin is part of the tetracycline family." C. "Declomycin is to be taken with food, preferably, milk." D. "Declomycin is contraindicated in children and pregnant/nursing women." 1. A patient has a sodium level of 123 and presents with confusion. The doctor diagnoses the patient with Syndrome of Inappropriate Antidiuretic Hormone Secretion (SIADH). Which type of hyponatremia is this? 2. A patient with a sodium level of 112 is taking Lithium. Which of the following is a nursing priority? 3. A patient with a sodium level of 178 is ordered to be started on 0.45% Saline. What is the most IMPORTANT nursing intervention for this patient? The answer is D: Give slowly and watch for signs and symptoms of cerebral edema. The most important intervention is to give slowly and watch for S&S of cerebral edema because a hypotonic solution can cause rapid swelling of the cell. Maintain a patent IV is correct but not the most important option in this scenario. 4. You have completed diet teaching with a patient who has hypernatremia. Which statement by the patient causes concern? 5. A patient with Cushing’s Syndrome has been experiencing an infection and has a fever of 102’F. On assessment, you find the patient to be confused, restless, has dry mucous membranes, and flushed skin. Which finding below correlates with the presentation of this patient? 6. Which patient below is considered hypernatremic? 7. A patient with a sodium level of 115 is ordered to start Declomycin. Which statement is NOT true about this medication? The answer is C: “Declomycin is to be taken with food, preferably, milk.” Declomycin binds to cations (calcium) and this affects GI absorption…it should be given without food. 8. A patient with hypovolemic hyponatremia is started on IV fluids. Which of the following fluids do you expect the patient to be started on? The answer is B: 3% Saline Patients with hypovolemic hyponatremia are started on a hypertonic solution (the circulatory system is dehydrated & and the cells are swollen…so a hypertonic solution will shrink the cells and increase fluid volume) and 3% Saline is the only hypertonic solutions. The other options are either hypotonic or isotonic. 9. A patient has a sodium level of 119. Which of the following is NOT related to this finding? 10. Which patient below is at risk for experiencing Hypovolemic Hyponatremia? 11. A patient has a sodium level of 130. What is this condition called?